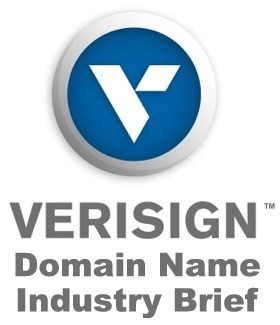 Verisign (the administrator of the .com and .net domain registries) has released their latest quarterly Domain Name Industry Brief covering the 4th quarter of 2017. The report revealed that the year ended with a total of 332.4 million domains (covering all extensions) registered worldwide. With 3.1 million domains added over the past year that represents a 0.9% increase year over year and a 0.5% rise from the prior quarter (3Q-2017). Verisign's .com and .net TLDs had a combined total of approximately 146.4 million registrations at the end of 4Q-2017, increasing 2.9% year over year and 0.4% from the prior quarter. .Com, by far the world's most popular TLD, ended the year with 131.9 million registrations, 5 million more than the 126.9 million reported one year ago (representing a 3.9% increase). As they did last quarter, ccTLDS (country code domain extensions), like the .coms, also continued to grow at a faster rate than the overall market. At the end of 2017 146.1 million ccTLDs were registered worldwide, a 2.4% jump year over year (compared to 0.9% for the entire market) and a 1% rise from the prior quarter (compared to 0.5% for the entire market). It was much rougher sledding for new gTLDs. As of December 31, 2017 there were 20.6 million new gTLD registrations, a 19.5% plunge year over year (a loss of approximately 5 million registrations). However, the rate of the new gTLD decline began slowing, with the drop from the previous quarter coming in at -2.4% (representing a loss of about 500,000 domains). You can read the full Verisign report here and the news release here. You can also find more information on Verisign’s blog.